An early look at Nissan's future crossovers. Nissan is in full electrification mode, as evidenced by the recent reveal of the IMs Concept at the 2019 Detroit Auto Show. The IMs previewed an all-electric sedan with two electric motors producing 483 horsepower. Seeing as crossovers are more popular than sedans these days, we were surprised to see Nissan debut a concept sedan rather than a crossover. Which is doubtless why Nissan is now showing an electrified SUV at the 2019 Geneva Motor Show. But don't think this is just an IMs with a higher ride height. It's called the IMq Concept and it is meant to preview the future of Nissan's crossovers. Unlike the IMs, which was purely electric, the IMq features a gasoline engine to help keep the batteries charged up. Even though the IMq has a gasoline engine, it isn't a conventional hybrid. Think of it more like the Chevrolet Volt - the electric motors drive the wheels but the gas engine only handles the duties of keeping the batteries charged - so, it is a battery-electric, not a hybrid. Nissan calls this powertrain e-Power and it is already available on the Japanese market Note and Serena models, where it accounts for 70% of sales for those two model lines. The IMq's debut in Geneva signals Nissan's plans to offer the e-Power system in Europe on customer cars by 2022. 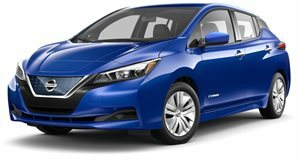 By 2022, Nissan says its electrified vehicle sales will increase five-fold and increase to double the market average. At this point you may be wondering how exactly this e-Power system works, seeing as it is quite different from conventional and even plug-in hybrids. Since the combustion engine isn't attached to the drive wheels, it is able to run at the optimum speed and produce superior fuel economy and fewer emissions. We love this type of powertrain because it boasts all the benefits of an EV without the crippling range anxiety when the battery gets low. Nissan didn't mention what size this engine would be but the Serena and Note currently use a 1.2-liter three-cylinder mill. Seeing as the engine isn't used to drive the wheels, the engine size shouldn't be of much importance. Unlike the Serena and Note, the IMq debuts the first all-wheel-drive application of the e-Power system, making it more useful for an application in a crossover. We think the design of the concept is easily one of Nissan's best but it is clear the IMq isn't production ready. Just look at those massive wheels, suicide rear doors, and futuristic interior. Most of all, the pictures Nissan sent us aren't even of a real car, but rather a computer-rendered vehicle. So while we don't think the IMq will ever come to market as its own model, the AWD e-Power drivetrain will definitely show up on future Nissan crossovers. We aren't sure which model will be the first to adopt this drivetrain but we'd place our early bets on the revived Juke.